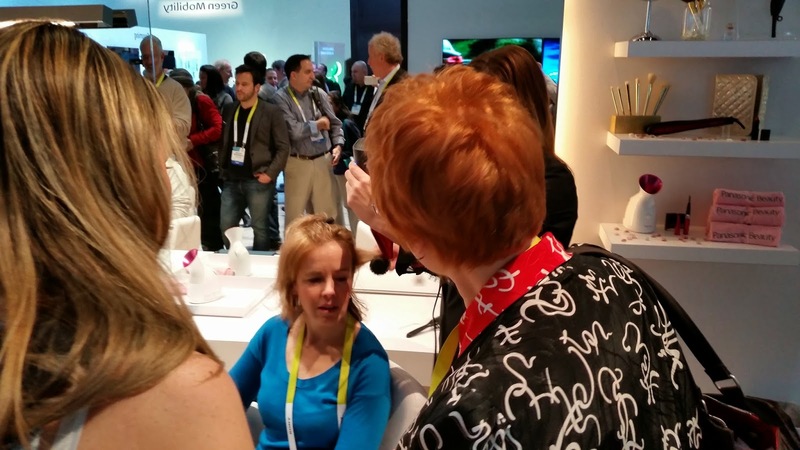 One of the most fun surprises at CES2015 was visiting the #PanasonicBeauty booth. When I was invited to attend CES this year as a guest of Techlicious I imagined that I would be transported into the world of CTP, Gigahertz, RAM, HDMI, Virtual Realities and a slew of computer terms that I would have to pretend to understand. But this was the Consumer Electronics Show and while the reps I spoke with were more than happy to delve into technical aspects of their toys they were also prepared to tell me what was the "cool factor" on the device that would make my life better. This was the case in a hands on demo at the Panasonic Beauty display in the Panasonic mega area at the conference. I was invited to an appointment with their beauty team to get a first hand demonstration of how their ionic hairdryer worked. 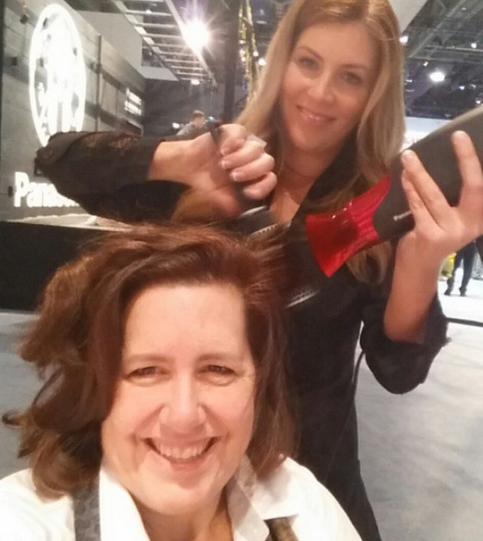 I was invited to a BlowOut! Some people (like my husband) have not heard that term before but there are entire beauty salons dedicated to the BlowOut which just means they don't cut your hair, they don't wash your hair, they only style your hair with a blow dryer. So, I scheduled my appointment first thing in the day so I could go through the conference with a beautifully styled hairdo. The exhibit hall opened at 9am and my appt was at 9am. I wasn't really thinking I would be WOWed but at least I knew that I could just show up to the conference that day without really worrying about my hair because that part, at least, would be taken care of. (Flashback sequence) Back when Saturday Night Live first came on air there was a character named Rosanna Rosanna Danna played by Gilda Radner. I could relate because we shared a similar hairstyle. One afternoon in the early 80's my mom and I jumped on a couple of Vespa's and explored Nantucket and Martha's Vineyard. It was a great day. We scooted around the island, I went body surfing in the ocean, and it was a super fun day. As we headed back on the ferry to mainland my mom handed me a very small comb and said "You better start now Rosanna Rosanna Danna and you might be done combing your hair by the time we get back to our car." When my hair is long it is big and it is frizzy. I have searched for the perfect product that would defrizz my mane. One of the big problems is that I really hate hate hate traveling with product. TSA makes you feel like a criminal for having some kind of liquid in your carry on and if we are going by car then the product typically ends up breaking through its container and covering everything in the trunk with it's sticky gooey awesomeness. I have frizzy hair. (Back to current time) So I sat down at the Panasonic Beauty booth ready for them to do their best with what they had to work with. WOW! The ionizing blowdryer by Panasonic really did work as advertised. It has a feature in it that actually moisturizes your hair while it's blow-drying it. SO when all was said and done my hair was silky smooth and perfectly coiffed. The stylist didn't use one drop of product. But I was in Vegas and had a long day ahead of me and so I was interested to see how long this would last in the dry dry air of the desert. At 10pm that night I was asking people to touch my hair - it was unbelievable. I still looked good without a single touch up all day long. And my hair felt amazing. As a full disclosure I was an invited guest of Techlicious at CES and they lined up the appointment with Panasonic and I was given a small Panasonic portable charger to keep my phone going all day (which came in super handy) as part of this promotion. But you really can't mess around when it comes to your hair. I am loving that I can use my regular old shampoo and a Panasonic Ionic Blowdryer (when it arrives from Amazon - of course I ordered one right away after the show with my own money - CES is not really the place where free samples are being handed out left an right) and that I won't need to use any other products to make my hair look Ah-mazing. My hair is long and thick but the other women who were there at the same time had very different hair and their results were similar to mine. One woman had very short hair that typically requires tons of product to get it to stay perky and the other woman had lovely long hair but it was very thin. So yes, I was surprised at CES by the beauty products that didn't have any techy jargon slowing me down from understanding how they worked. 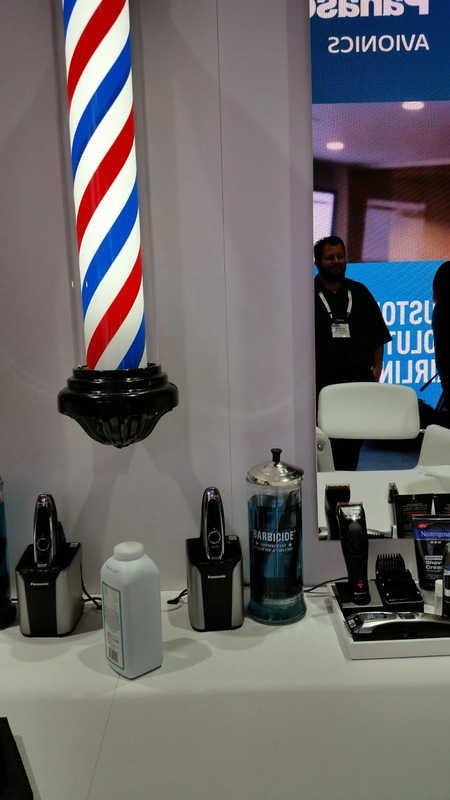 On the guys side of the display they had a full on barber shop with a full display of the wet dry shavers. My boys hate going to the barber shop and so early on they started giving each other hair cuts. The Panasonic grooming tools for men are worth the money. In both cases, for men or women, the products are a little bit more expensive than if you went to the corner drug store to pick up a similar tool - but then again you are getting something that really works and will save you money in the long run. What I love about the guys shaver from Panasonic is that it has these wild sensors in it so they can get a smooth shave even around their neck - my youngest has hated shaving so much that on most days he lets these wonky, young, whispy, funky, hairs grow around his neck and he looks a little bit like a hippy. So now, when his new shaver arrives, he can deal with this. Not only that but the shaver has a recharging base that also cleans the shaver while it charges. I love that. Techlicious and Travelingmom are having a Twitter party so we can all share our excitement for how technology is making our lives easier and more beautiful. Join the conversation!